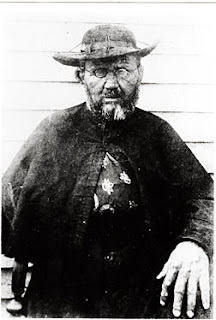 The requisite miracle for his canonization approved in May, the Pope yesterday green-lighted the elevation to sainthood of Bl Damien deVeuster -- the Belgian priest (1840-89) who spent his life ministering to the leper community on the Hawaiian island of Molokai, eventually contracting and dying of the disease. Beatified in 1995, the news gives Stateside Catholicism its seventh product raised to the honors of the altar, and is notable on a global level given the widespread devotion to Bl Damien as unofficial patron of HIV/AIDS patients. Benedict XVI accepted 13 decrees of miracles, martyrdom and heroic virtue presented to him yesterday in an audience with his lead saintmaker, the prefect of the Congregation for the Causes of Saints Cardinal Jose Saraiva Martins CMF. Notable among the other causes advanced in the session was that of Chiara Badano -- a lay member of the Focolare movement who died of bone cancer at 18 in 1990. The pontiff approved the declaration of the young woman's "heroic virtue," meaning that the congregation's exhaustive investigation into her life found it reflective of a significant level of holiness. She's now entitled to the designation "Venerable." Also approved was a miracle attributed to the intercession of Louis and Marie Guerin Martin -- the parents of St Therese of the Child Jesus, the famed "Little Flower"; the couple will be beatified together. For deVeuster, the Martins and the other three causes with miracles or martyrdom approved, their respective dates of canonization or beatification will be fixed at a consistory presided over by the Pope, likely in the fall. "You gotta have faith," said the 80-year-old Aiea woman, who was cured of a rare form of cancer after she prayed to Father Damien De Veuster. Canonization awaits for Damien now that Pope Benedict XVI has approved a miracle attributed to the intercession of the Belgian priest, who cared for leprosy patients in Kalaupapa. The pontiff agreed with the Vatican's Congregation for the Causes of Saints that Toguchi's recovery from her illness defied medical explanation. Toguchi, a retired social studies teacher and granddaughter of a leprosy patient who had been banished to Molokai, said Damien is deserving of sainthood. "He has always been special to me. From when I was a little kid, I used to hear stories about him. I grew up with people around me who talked about him a great deal," she said. In 1997, Toguchi was diagnosed with liposarcoma, a cancer that arises in fat cells. She underwent surgery a year later. A tumor the size of a fist was removed from the side of her left thigh and buttock. Unfortunately, the cancer spread to her lungs. Her physician, Dr. Walter Chang, told her, "Nobody has ever survived this cancer. It's going to take you." A month later, Chang noticed the cancer was shrinking. In four months it was gone. Chang, astonished, asked what she had done. She told him, adding, "You just gotta trust. You gotta have faith." Toguchi said she plans to travel to Rome with her husband of more than 50 years, Yukio, and one of their two sons for the canonization. The date has yet to be set. Others in the Roman Catholic community in Hawaii are also ecstatic. "I think it's with great elation that we, who have been praying so hard and ardently for Father Damien's canonization, can breathe a sigh of relief," said the Rev. Christopher Keahi, head of the Congregation of the Sacred Hearts of Jesus and Mary in Hawaii, of which Father Damien was a part. "Now we can look forward to the canonization in Rome." It bears repeating that the saint-to-be's longtime collaborator and, after his death, successor as lead caretaker of the Molokai colony, the New York native Mother Marianne Cope, was beatified in 2005. Along with four other American blesseds -- two of whom (California's Junipero Serra and the "Lily of the Mohawks" Kateri Tekakwitha) mark their feasts in July -- her cause continues on.